Spring Steel – Block Steel Corp.
Spring steel’s capacity for withstanding impacts and irregular bending comes from the quantity of silicon with which it is alloyed. Silicon allows the metal to bend and stretch without becoming permanently deformed. Spring steel is a good raw material for manufacturers that need strong, heat and abrasion resistant metal. Different spring steel varieties offer different qualities of flexibility and hardness. Cold rolled annealed spring steel, for example, is used to manufacture automobile parts, knives, small files, mechanical springs, clips, machine parts, gun parts, and anything requiring the properties of high carbon. 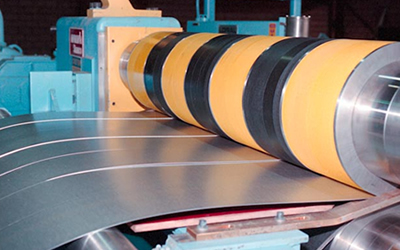 Blue tempered steel, on the other hand, is the more economical option and is often used to produce blades used in health care settings, flat springs, motor springs, steel tapes, valves and reeds. The molds for plastic injection molding are often made of spring steel. Spring steel can also be used to make certain kinds of music wire like piano and guitar strings. Spring steel is formed at steel service centers. Steel service companies offer a wide range of services that can impart various qualities upon steel. The different spring steel varieties each require a certain kind of steel working process in order to take on the qualities that will make them usable. Tempered spring steel, for example, is heated in a way that increases hardness without sacrificing flexibility and impact resistance properties. Annealed steel is heated until the steel becomes pliable, but the annealing temperature is always kept below the steel’s recrystallization temperature. Spring steels that are subject to heat treatment processes may contain additives like cobalt and nickel in order to improve the metal’s performance under high temperatures. There are several other manufacturing processes spring steel may undergo to increase its properties, including quenching in oil or water; these take place after heat treatments in order to cool and harden the steel. Air hardening is another post-heat-treatment hardening method; it can be more economical than quenching methods and just as effective. The shape of spring steel can also be changed to fit specifications through slitting, edging, leveling and other physical shaping methods. Spring Steel Spring steel is a steel variety characterized by its resistance to impact and deformation. Spring steel features medium to high levels of carbon, which, when increased or reduced in a steel affects its properties of hardness and oxidation resistance.